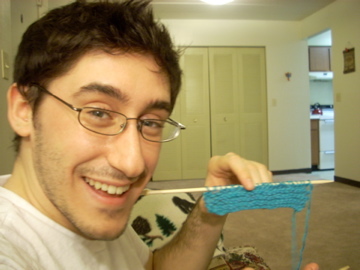 This past week I had the honor of introducing a muggle to the magical world of Knitting. And not just any muggle, but my boyfriend the muggle (henceforth referred to as "The Composer"). I even let him use my ball winder. The picture is blurry because he was having too much fun. 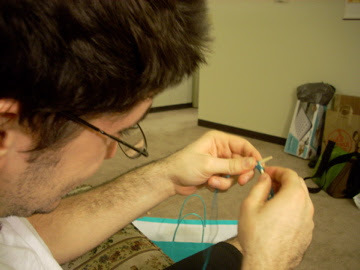 I taught him how to cast on and how to do the knit stitch. I knew that he was hooked, but I don't think he realized it yet. And yes, I do have a floral couch decorated with knitted and crocheted blankets. You all knew I was an old lady at 23, right? And look, progress! I should tell you - that night he stayed up until 2am knitting on that swatch and I very distinctly heard him say "Just one more row..." several times. We all know what that means, right? Yep, he already brings his knitting with him everywhere and takes great pride in showing it to everyone who happens to walk by. He's doing a good job, isn't he?! 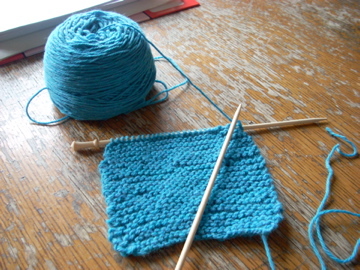 He (well, I) bound off that swatch and called it a potholder only to cast on for his first scarf during class this past Tuesday. Yep, knitting in class. He's hooked. 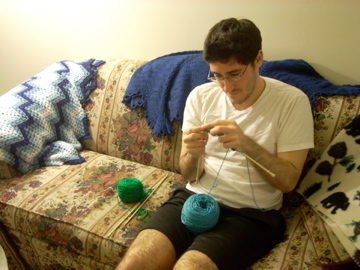 And that's how yet another cute male knitter was born. Oooh, and he's cute, too! Well done, my friend, well done. My daughter taught her boyfriend how to knit just this last week. She called me to tell me she may have just one regret in her life..teaching him. I asked "why?" and she said, "I asked him for a kiss, and he said, ok I just have two more stitches!" Yep, I guess that's another way you know when you have a convert! The Composer is doing an excellent job, Peter :=) How wonderful of you to teach him, and yes, I'd say he's a keeper!! I'm glad he can share your love for knitting. Nice work! Glad I finally got to see a pic of The Composer. Is it just me or does he look a bit like Jake Gyllenhaal? He DOES look like Jake Gyllenhaal! Yippee, congrats on both the conversion and the cutie!! What a cutie. I love the blurred photo...like trying to photograph a puppy. This has been a happy day. Peter, I'm so glad that you have a sweet guy in your life! He's adorable and it's great that he wants to learn the "craft." I'm sure he will learn and you are a patient teacher. Be well and happy knitting! Agree with everyone else that he's super cute, but I have to wonder if teaching an SO to knit is a wise decision... First: more competition at LYS sales. Second: he might be using your size 7s when you need them (why is it always 7s?). Third: (and scariest of all) he might want you to share your stash! I hope you considered these things carefully. If he's worth all that trouble, then you have truly found a good man. Muggle-no-more, I'm thinking. Just remember the boyfriend sweater rule. You are, however, allowed to gift him with needles so he doesn't make off with yours. You are a lovely couple. A pity my partner is not interested in learning knitting. teh cute, it BURNS USSSSSSSSS, precious. I think that's my grandmother's old sofa. Let me know when The Composer is ready for his own supply of cashmere. Yup my boyfriend was also very intrigued by the swift and ball winder when I first took him to a yarn shop. He did learn to knit, but it didn't have any staying power for him. But that's fine...more yarn for me! 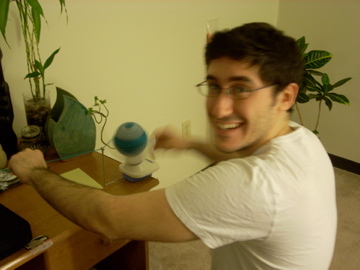 love how excited he looks with the ball winder. so cute. You had him at the ball winder. Congrats on converting yet another muggle. Sniff sniff....I'm so proud of you. Congrats - to both of you! So adorable! If he likes mechanical yarn-related things, I bet he would love playing with a niddy-noddy. And may I say, your honey is six shades of cute! Handsome AND talented? You've hit the jackpot. Je vous souhaite de belles réalisations à vous deux ! C'est trop chou !